With an 11-letter word, Rachel Moore took the title as the youngest spelling bee champion in Genesee County. 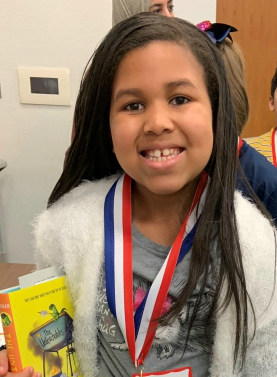 Rachel, a fourth-grader in Sydney Wheeler’s classroom at St. John Vianney Catholic School in Flint, correctly spelled the word “destination” to be crowned this year’s champ for her grade level. She was among 226 students from throughout Genesee County who competed in the annual spelling bee competition hosted by the Genesee Intermediate School District last month. All the participants already brought top honors to the competition — each had to beat out all the other spellers in their grade at their school. Honors were given to first, second, and third place finishers in fourth through 12th grades — and a special championship round also highlighted the best of the best junior high (fifth through eighth grade) and high school spellers. The top two finishers from each grade faced off to determine those divisional champions. Among the junior high division, Grand Blanc area students swept the winnings with first place going to Aurora Akinpeloye from Grand Blanc East Middle School followed by Joshua Tewolde from Grand Blanc West Middle School and Kamaria Carter-Ryan from Woodland Park Academy. In the high school division, Flushing High School junior Lily Zuber nabbed first place followed by Connor Davenport, also from Flushing High School, and Danielle Vallieve from Bentley High School. 10th Grade:1st – Connor Davenport – Flushing High School, 2nd – Tamiah Redwine – Mt. Morris E. A. Johnson High School, 3rd – Isaac Tift – Flushing High School. 11th Grade:1st – Lily Zuber – Flushing High School, 2nd – Madison Griffin – Flushing High School, 3rd – Gabriella Smith – Lake Fenton High School. 12th Grade:1st – Jacob Castles – Flushing High School, 2nd – Dominic Shiel – Mt. Morris E. A. Johnson High School, 3rd – Jessenia Cranfill – Mt. Morris E. A. Johnson High School.